Mauritania, a country in North Africa bordered by Algeria, Mali, Senegal, Western Sahara, and the Atlantic Ocean has a total land area of 397,954 square miles and a population of over 3.29 million. Almost 75% of the country is claimed by desert area and the rest is mostly flat plains with fault scarps (seismological uplifting of the earth) running though the middle. Some of these scarps have oases at its base. The concentric Guelb er Richat (aka Bull’s Eye) is a prominent feature of the country. This poor desert nation is rich in resources, but as privatization is only starting it will be a while before it lifts itself out of poverty. Mauritiana is more for a hardy traveler than for a tourist. December through February are the best time to visit the country. Though it is rated as a high-alert destination no major incidents have been reported yet. Mauritania Travel Map 978-1553413226 $12 1:2,000,000 Scale. The first stamps of Mauritania were a set of sixteen stamps released between 1906 and 1907. The set (Scott #1 to #17, #6 missing) catalogs for around $330 mint and $270 used. They were French West African key types with the inscriptions “Mauritanie” in Red or Blue and “Afrique Occidentale Francaise” inscription as part of the design. The set features General Louis Faidherbe, oil palms, and Dr. Noel Eugene Ballay. Imperial France took over areas of Mauritania starting in the early 1900s. It became part of French West Africa from 1920. Dr. Bally was the second governor general of French West Africa. The first set was followed by a long-running set issued between 1913 and 1938 depicting Crossing Desert. That set (Scott #18 to #54) catalogs for around $40 mint and around the same for used. 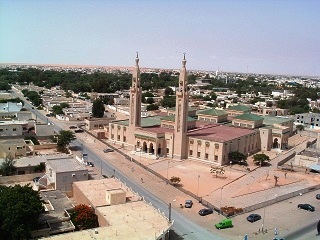 About 75% of Mauritania is desert of semi-desert which has been expanding since the 1960s. Surcharge overprints on the Desert issue along with some common design types were the primary issues of Mauritania during the period till 1938. Mauritania issued another long set of thirty four stamps depicting Desert scenes between 1938 and 1940. The set (Scott #76 to #108) catalogs for around $100 mint or used. The designs show camel rider, Mauri couple, Mauris on camels, and family before tent. A stamp released on January 20, 1960 to commemorate the proclamation of the Islamic Republic of Mauritania. The stamp (Scott #116) is inexpensive and catalogs for around 50c mint and around 25c for used. The design shows camel and hands raising flag. The country has two main ethnic groups (Black Africans and Arab Berbers) and the stamp design succeeds in depicting unity between the two groups by having a hand from each group holding the flag. A set of six stamps released on February 28, 1978 in the Wildlife Fund theme. The set (Scott #383 to #388) catalogs for around $35 MNH and around $6 used. The stamps have the WWF emblem and feature the following: Sable antelope and Wildlife Fund Emblem, gazelles, manatee, aoudad, elephant, and ostrich. A set of five stamps released in 1984 in the Fishing Industry theme. The set (Scott #558 to #562) catalogs for around $4 MNH and around a dollar for used. The designs show tuna, mackerel, haddock, black chinchard, and boat building. Another set in the Fish theme was also released on October 16, 1986. That set (Scott #614 to #615) catalogs for around $5 MNH or used. Mauritania’s coastal areas are considered the richest fishing areas of the world. A set of four stamps released on January 1, 2003 showing Tourist Attractions. The set (Scott #760 to #763) catalogs for around $9 MNH or used. The designs show Sailboats of Banc d’Arguin, Ben Amera, desert warthogs, Diawling Park, palms and Tergit. A few other sets (Trains – Scott #757 to $759, Handicrafts – Scott #764 to #767, Historic Towns – Scott #768 to #771) released in the same year also enjoy good philatelic interest and all of them catalog in the $10 range. Bamc d’Arguin is a National park on the west coast. It is a World Heritage Site and is a major breeding site for migratory birds. Diawling National Park is the area around the Senegal River delta. It is part of a Trans-Border Biosphere Reserve that is a popular bird nesting site. The first coin of Mauritania was a Republic Standard Coinage (5 Khoums = 1 Ouguiya) Aluminum Coin issued in 1973 showing National emblem divides date above value in Obverse and Star and crescent divide sprigs within circle with legend around border in Reverse. The issue has a mintage of 1M and catalogs for around $3 in UNC. A Copper-Nickel-Aluminum issue of the same year in similar design catalogs at around $85 UNC. Commemorative gold coins were first issued in 1975 with the 0.7714 troy ounce issue of 1975 to mark the 15th anniversary of independence. The design shows Star and Crescent flanked by palm trees below date in Obverse and Value in square flanked by a camel head and fish with design above in Reverse. The issue has low mintage (1800) and catalogs for a good premium over bullion value. Coins $4 and up Common UNCs start around $4. Recent Bi-metal coins in BU start around $10. 1-50 Ouguiya Complete Coin Sets in UNC start around $20. Paper Money $4 and up Recent UNCs from the 1990s and 2000s start around $4. Recent Consecutive Serial Number UNCs with 10-pieces or more start around $30. Bundles, Rare Specimens, Very Low Serial Numbers, etc go well into the 100s. Antiques $10 and up 19th century maps start around $10. 18th century and prior maps, Green Serpentine Stone Beads, etc start in the 50s and go well into the 100s. Authentic Touareg Mats start around $1000. Miscellaneous Collectibles $3 and up Flag badges, pins, etc start around $3. Authentic Conus Shell Beads, Kiffa Glass beads, etc start around $20. Neolithic Scorzalite Tube Beads, Blue Diamond Kiffa Beads etc start around $75 and go well into the 100s.